As if usually the case, I had every intention of Doing All The Things this weekend. I was going to get all kinds of stuff done and maybe even mark a few things off the List of Husbandly Sloth. However, as is always the case on Monday, that didn’t so much happen. I guess I shouldn’t feel too bad, though. The biggest reason I didn’t even end up looking at said list is because Saturday was Princess Puddinette’s actual, real-live birthday. I suspect that some of you are a probably thinking, man, what a Jerky McJerkface, to lie to his readers about his kid’s birthday this weekend JUST to avoid changing the light bulbs in the garage! But, no, really. I swear! Saturday was the anniversary of her actual birth! Still not buying it, huh? Well, who can blame you? I suppose I have confessed to particularly egregious Acts of Sloth in the past. But! The good news is that I’m totally on the up and up this time. Plus, I even have documentation to back up my preposterous claims. Exhibit A: I wrote this post about it exactly nine years ago Saturday. Exhibit B, exactly five years later to the day, I wrote the infamous earring post on her fifth birthday. If I let it creep into my brain, I imagine I’d probably be wondering just exactly how I seem to have lost track of all the days in between those two posts and this one—I mean, how did my little girl get to be 9 YEARS OLD?—but that’s some depressing contemplation for another time. If I start to dwell on questions like that, next I’ll be asking how my 11 year-old son has a more active social life and than I do, or how my 10 year-old son is better at setting up his personal electronics than I am, and then, well, yeah. Let’s just say it’s almost enough to send to me to a dark room with tall glass, an bucket full of ice, and a bottle of something caramel-colored that had been aged in oak barrels. At any rate, when one’s inexplicably 9 year-old daughter has a birthday fall on a Saturday, well, you don’t tell the family to come over the following Wednesday evening for cake and ice cream. Not if there’s a perfectly good sunny Saturday afternoon available for the taking. So that’s what we did. We ventured out into the early summer sun (well, technically it’s still late spring, but nobody likes Pedantic Middle-Aged Technicality Guy) with one of Grammy Puddin’s famed Oatmeal Cakes, a box of lemonade cupcakes, and a bunch of gifts for one very happy nine year old. Over the course of the day, she got a ton of things that made her smile—which is really all I cared about—including some clothing stuff from a place called Justice, which I’ve been led to believe is nirvana-at-the-mall, and home to all the joy and wonder a not-quite-little-anymore girl just shy of double digits wants or needs. Admittedly, I don’t know about all that, as I’ve never set foot in the place and intend very much to see that streak continue until the end of All Human Life on Earth. But I’ll let it slide for now because on Saturday she was much pleased, and I’m willing to overlook a host of egregious sins when that case for any of my kids. Still, if you ask me, the best gift she got was from the her loving parents, a stuffed giraffe head just begging to be mounted on the wall pink room. And she must have thought the same thing, because the thing delighted her nearly as much as it delighted me. 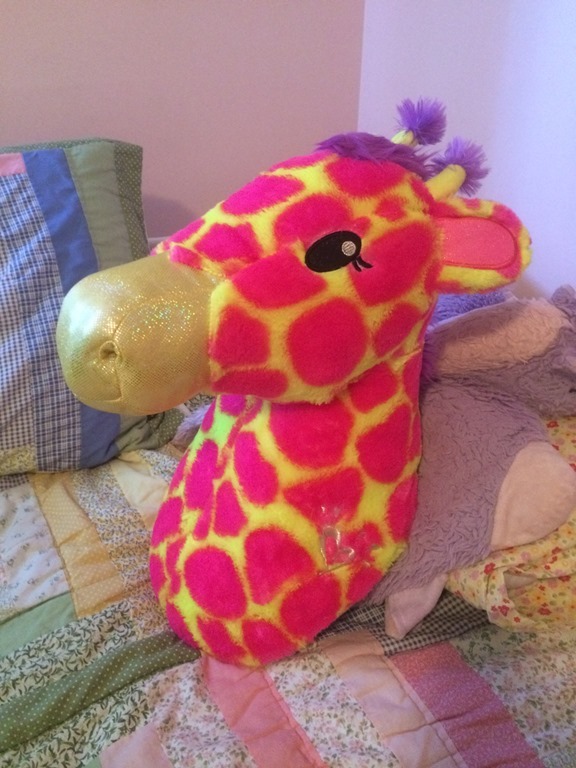 Of course, “Hang Giraffe’s Head” has since become a new item on my ever-growing household To-Do list. I wonder how long until I get around to that? 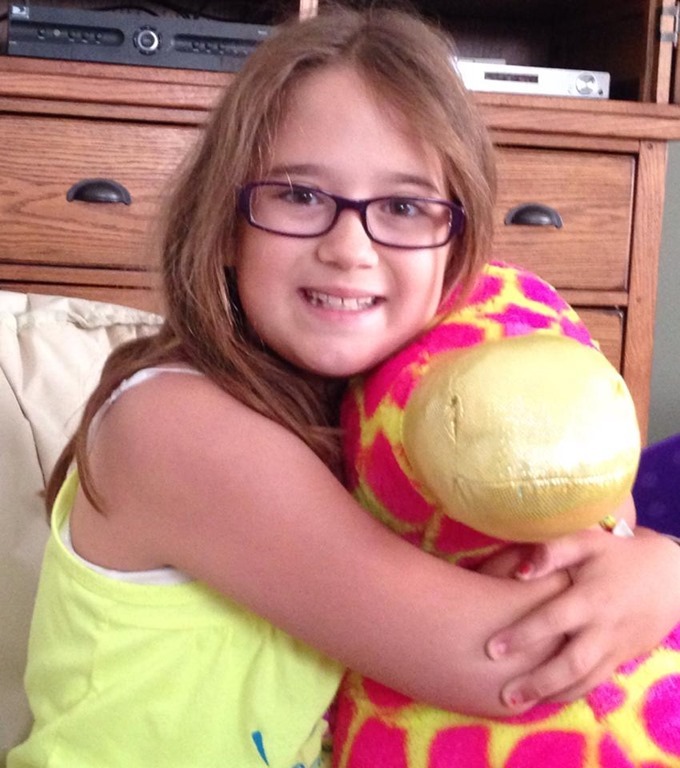 Every nine year old girl NEEDS a pink and yellow giraffe head, don’t they? ?